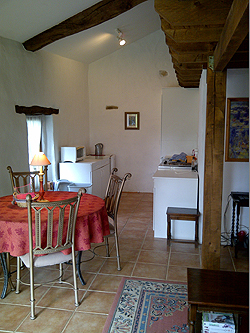 The gite comprises: living area, a kitchenette, bathroom with shower and bedroom above on a wooden dais. 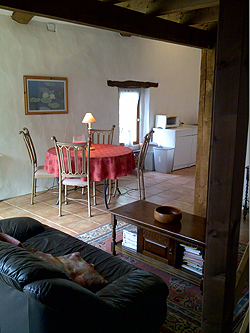 The large French windows leading to the outside give the gite a light and airy feel. L-shaped living area (43 sq.m / 463 sq.ft) with wooden staircase leading to raised dais. Sofa bed and coffee table. TV and video recorder. Furnished with two electric plates, sink and fridge with freezing compartment. Small electric worktop oven. Large table and 4 chairs. Shower, toilet and wash basin (5.5 sq.m / 59 sq.ft). Double bed, wardrobe and seating area on wooden dais. Except for the wooden dais the whole area has typical French ceramic floor tiles (tomettes). 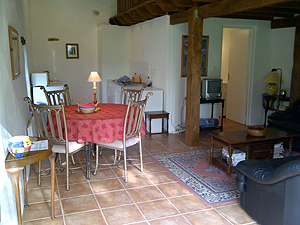 To reserve the gite click here. To view the adjacent self contained main house click here.